The award, which comes on the eve of the Center for Ideas and Society’s 30th anniversary in 2019, is the largest the center has ever received. It will support a series of fellowships for faculty members pursuing humanities and humanities-related scholarship, said UCR’s Georgia Warnke, center director and distinguished professor of political science. The grant reinforces UCR’s commitment to further enhancing its profile in the humanities and related fields at a time when funding and programming for such fields are under threat at public universities across the country. Moreover, it plays a crucial role in leveraging support for the humanities across UCR. A gift to the university’s Living the Promise campaign from William R. Johnson Jr. and S. Sue Johnson will play a leading role in sustaining the program beyond The Mellon Foundation’s grant. Additional funding will be provided by UCR’s College of Humanities, Arts, and Social Sciences, as well as the Office of Research and Economic Development. 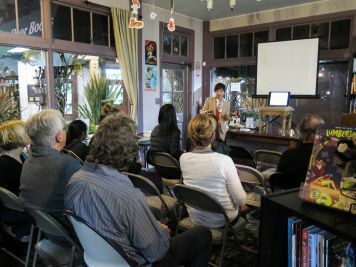 The center supports a series of faculty book talks. As part of the project, a total of 26 faculty fellowships will be awarded between 2019 and 2025. The Mellon Foundation’s $1 million grant will fund 22 of the fellowships over a four-year period beginning in fall 2019. Support from UCR partners will fund four more faculty fellowships and extend the program by two years, with a goal of using this time to secure long-term funding to continue the program. Milagros Peña, dean of UCR’s College of Humanities, Arts, and Social Sciences, which houses the Center for Ideas and Society, said the awards underscore the work of the center in showcasing the humanities. “The commitment by The Mellon Foundation will be the basis for expanding support for the humanities through additional fellowships and grants from the College of Humanities, Arts, and Social Sciences, all with the goal of building an endowment for the Center for Ideas and Society that allows for research, ideas incubation, and project collaborations across disciplines,” Peña added. Mellon Term Professorships will support senior-level faculty members with records of scholarly excellence. Mellon Dean Professorships will be used for purposes of recruitment and retention. Mellon Second Project Fellowships will aid faculty who have completed a major first project and need time off from teaching to complete a second project. Along with allowing time and resources for scholarship, the fellowships will foster a larger community of interdisciplinary humanities scholars by encouraging recipients to engage with the center through a variety of activities and initiatives. One potential opportunity will pair faculty members with recipients of the center’s Mellon Mays Undergraduate Fellows. 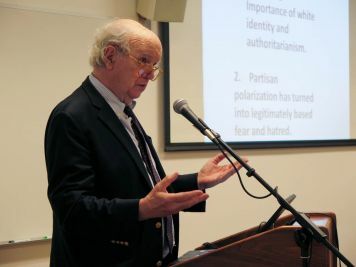 New York Times columnist Thomas Edsall appeared at a center talk in 2017. Funded by The Mellon Foundation, the Mellon Mays Undergraduate Fellowship program at UCR provides financial support, research mentorship, and application assistance to rising juniors and seniors with master’s- or doctorate-level aspirations in the humanities. Also supported by The Mellon Foundation is the center’s Mellon Advancing Intercultural Studies program. S. Sue Johnson is a chair of Living the Promise, the Campaign for UC Riverside, as well as a UCR alumna and former UC Regent and board chair of the University of California system. More about the Center for Ideas and Society: Established in 1989, the Center for Ideas and Society is an interdisciplinary research support center dedicated to advancing humanistic studies and creativity at UC Riverside. Its fellowships, research workshops, and public events strengthen the intellectual and creative life of the university by bringing the humanities disciplines into dialogue with one another and with the surrounding community.